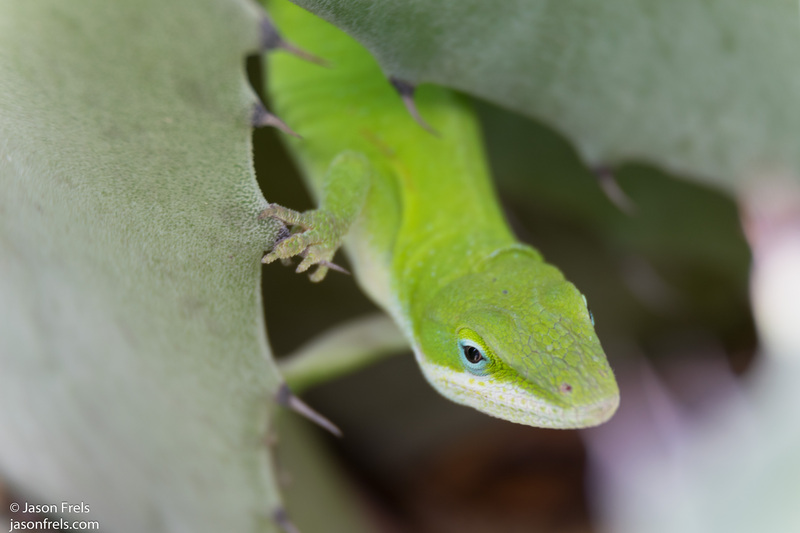 I saw a little green lizard on my back patio, so I decided that I would try to catch him and get some close-ups of him with my extension tubes. I was careful not to hurt him and I didn’t want him to shed his tail like they sometimes do to get out of trouble. I found a container to keep him in while I set up the camera and then tried to put him in a planter, but he got away from me. 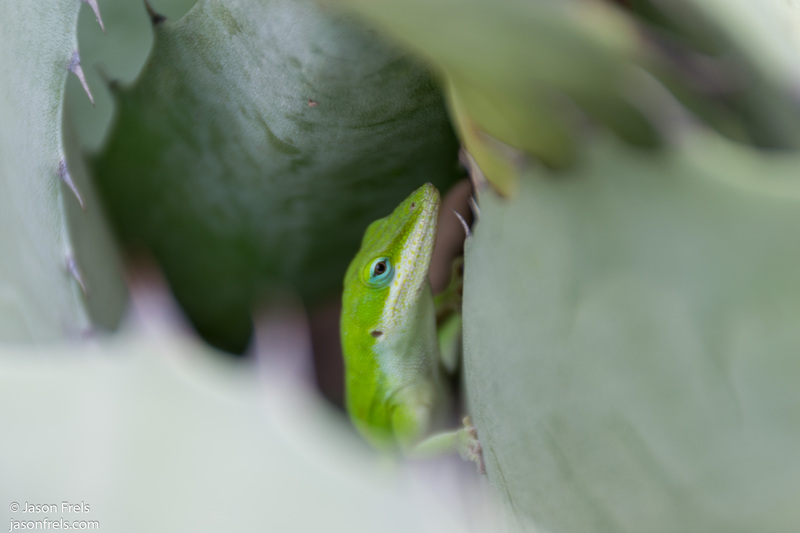 So, I chased him to a plant where he was hiding and tried to get a few pictures. Below are two of the picture that I got with the extension tube on the camera. This was my Nikon D5300, 36mm extension tube, and 18-140mm kit lens with a 140mm focal length. Autofocus was not able to work well with the extension tube, so I used manual focus and the view finder to get close in through the thorns. Once he felt safe hiding in the thorns, he didn’t move much, so I got to shoot around from different angles. 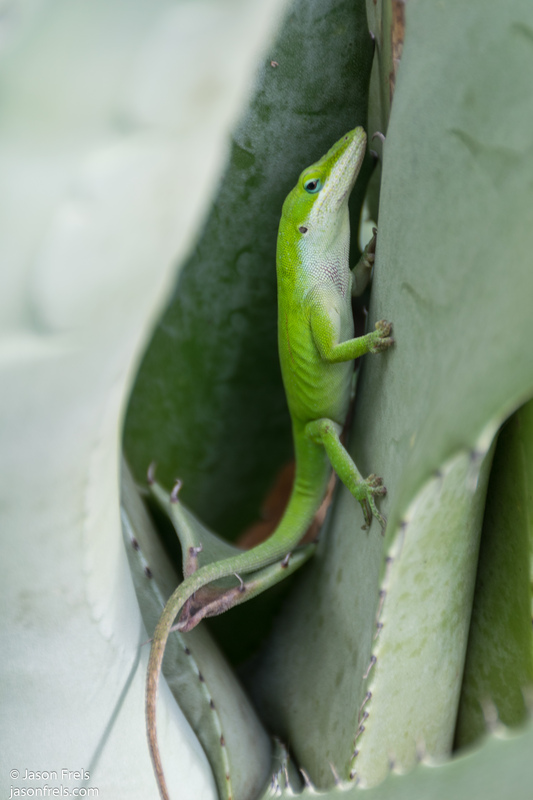 I like having his foot gripping the thorns on the plant and I was also able to get his eye in focus. I decided to take off the extension tubes and get back from him a little bit to hopefully get better focus. This is still with the 18-140mm lens, just standing back a bit trying to get his entire body in the picture. Focus depth was still a bit of an issue with the zoom close-up. I was concerned that he might blend in with the plant and not show up well, but he is bright green a pops out well enough. I tried to get several angles of him hiding among the plant stalks. And that’s where I left him, hopefully eating lots of insects. Didn’t do much in Lightroom with these images. Just brightening and cropping and tried to sharpen the eye a bit in a couple of the pictures. These were all hand-held, zoom, crouching around a plant and I wasn’t able to get everything razor-sharp. 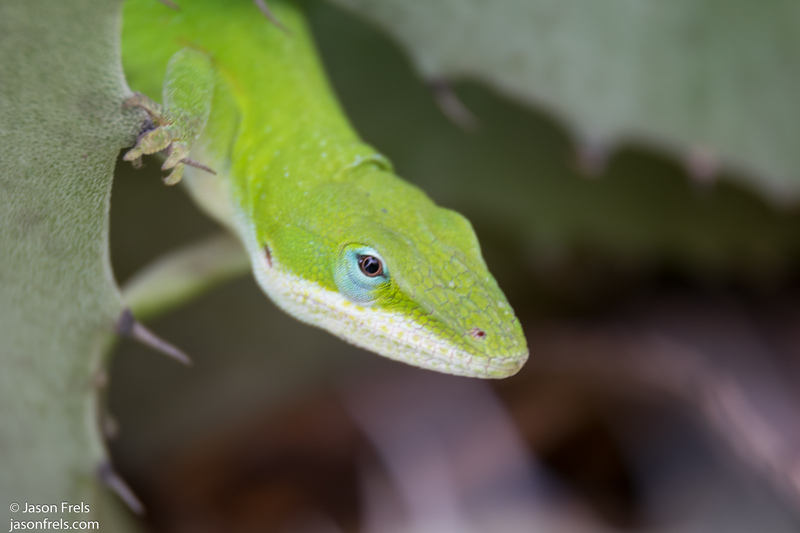 The lizard was so green already, he didn’t need any saturating. Great shots. I had no idea they lose their tails. Yeah, I catch a lot of lizards that get into my house. Sometimes when I catch them, their tale falls off I guess to help them get away from predators. I just want to put them back outside because if they stay in the house, they end up dying of dehydration or starvation and I find their corpses. I’d rather they be in the yard eating insects. I learn something new everyday! That’s interesting.Thanks.